You should be ashamed of what your students represent. The do not represent Catholic moral teaching. They do not represent Christ. They do not represent goodness. Instead they represent the worst of racist impulses. And that will now, sadly, be your legacy. Well I think we all know now where the boy got his attitude don’t we. 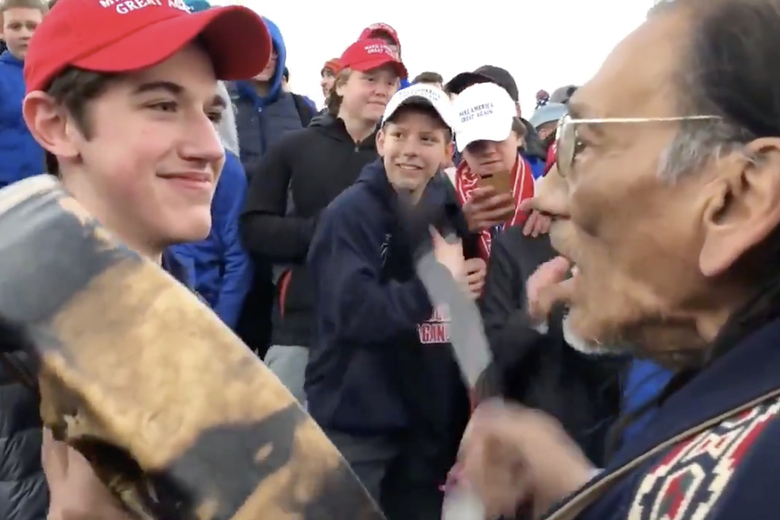 The teenager was among a group of students wearing Make America Great Again hats who were criticised for intimidating the musician Nathan Phillips, surrounding him to jeer and chant “build the wall, build the wall”. But his mother claimed “black Muslims” had been harassing the group of Donald Trump supporters from the private, all-male Covington Catholic High School in Kentucky. This sad boy is doomed to a life of racist idiocy. And, yes, it always comes from the parents. You show me a racist kid and I’ll show you a racist family. Videos of the confrontation are disturbing, discouraging, and – frankly – appalling. And they are rightfully inspiring a tidal wave of condemnation, even on the City of Covington’s own social sites, leaving the impression that these are the values of the City of Covington. Yes, the ironic thing – as people keep pointing out to me – is that the school isn’t even located within Covington. But that’s not the point. In answer, let me – as Covington’s mayor – be absolutely clear: No. The videos being shared across the nation do NOT represent the core beliefs and values of this City. And more, which do read. #SnowPocalypseMageddon19 – snow sufficient in volume to ensure lots of Baptists will stay home from worship (but not anything else). The first thing you learn about the ‘Progressive’ ‘Christians’ – they have an incredibly short attention span and little interest in actual solutions to real problems. Their aim is to damn anything they disagree with and demonize anyone who disagrees with them. The story of Einsiedeln is worth repeating. The name comes from “einsiedler,” a hermit; hence the Latin name for the place is “Emitarum Cœnobium.” Meinrad was the hermit from whom it derived its origin. He was a native of Rottenburg, twenty-five miles south-west of Stuttgart, but was educated in the famous Benedictine abbey school on the island of Reichenau in the Untersee, three and one half miles north-west of Constance, and after a brief experience as a secular priest became a monk in that monastery. At some later date he was sent to teach at the abbey’s branch school at Oberbollingen, on the Lake of Zurich, near its eastern end and twenty miles from Zurich. Across the lake were mountains and dense forests, and as he day by day gazed towards them he was seized with the desire to bury himself in those solitudes and so cut himself off from contact with men. Accordingly he crossed the lake in the year 829 and made his way to the pass of the Etzel, a small mountain a couple of miles south of the Lake of Zurich and some twenty miles south-east of Zurich, and lived on the spot for some seven years. He had the same experience which distressed many other hermits—his solitude was invaded—so he removed to another spot in the “Gloomy Forest,” as the forest was called, to the plain where Einsiedeln is built, about four miles south of his first abode. There beside a spring he put up his hut and a little place for prayer. On Tuesday, January 21, 861, he was visited by two men who, probably under the misapprehension that he had hidden treasure, murdered him. Forty years later there were a number of hermits living where the martyr had fallen. Thirty years more and the huts had been abandoned for a regular conventual building. In 948 the chapel of Meinrad was enclosed in a church. Conrad, Bishop of Constance, in whose diocese Einsiedeln was till the beginning of this century, came down to dedicate this enclosing church to the Virgin Mary and the holy martyr Mauritius, and at the same time St. Meinrad’s chapel to the Virgin Mary. But at midnight preceding the day set for the dedication, (Thursday, Sept. 14, 948) while the Bishop and some of the monks were praying in the church, they heard angelic voices singing in the chapel the dedicatory service. Consequently he refused the next day to undertake the duty for which he had come, as far as the chapel was concerned, declaring that it had already been consecrated and in a sublime manner. Einsiedeln was the most popular pilgrimage site in Switzerland in the 16th century. And when the Reformation took hold in Zurich, pilgrimages there were stopped. *Samuel Macauley Jackson, Huldreich Zwingli: The Reformer of German Switzerland (1484–1531) (Heroes of the Reformation; New York; London: G. P. Putnam’s Sons; Knickerbocker Press, 1901), 99–101. was Professor of Old Testament at the University of Göttingen, Germany, and one of the most important biblical scholars of the twentieth century. Among his many publications in English are Ezekiel, 2 vols. (Hermeneia; Fortress Press, 1979/1983), I Am Yahweh (1982), The Old Testament and the World (1976), and The Law and the Prophets (1965). Three of his works are still in print and those which aren’t can usually be tracked down at places like Alibris.com or Powells. He was really a tremendous intellect and though some of his ideas have fallen out of favor, he is one of those giants on whose shoulders we all stand and we can only see as far as we do because he came before us.